Take off on an epic vacation to your top bucket list travel destinations. When you return home, pin your adventures on your very own 3-Panel Executive World Map. 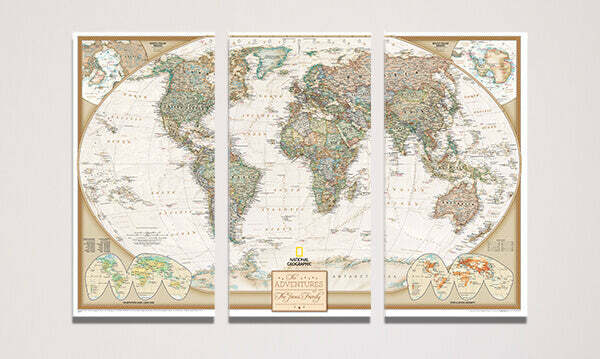 We’ve partnered with the map gurus over at National Geographic to personalize and print this exquisite, highly detailed map on premium canvas and transform it into a 3-panel gallery wrapped map to create a fresh, modern look and feel. The antique color palette, elegant 3-panel frameless map design and the rich canvas texture work together to create a true work of art. It’s not hard to see why our Executive World map is one of our most popular world pin maps. It beautifully compliments almost any décor! The extra-large size of this 3-panel traveler’s map gives you more pinnable space and larger font sizes. See how your 3-panel world pin map instantly becomes your favorite conversation piece as you trade stories about past and future travels with visiting family and friends. Don’t forget to personalize your map with one of our six customizable personalization options to create a one-of-a-kind interactive art piece. Makes a unique gift idea for your wanderlust stricken loved ones for any occasion! We understand one personalization design does not fit everyone’s style and taste. That’s why we have created 6 unique personalization options to choose from, so you can truly make your map your own. Select your favorite template from the drop-down menu above and enter your text in the provided box. If you would like a pin legend to designate what each pin color on your map represents, select “yes” from the second drop-down menu and enter your legend text in the provided box. Keep an eye on your email (and spam folder) after placing your order in case we have any questions about your personalization. If you want a proof of your personalization, simply leave a note in the personalization text box that says: “send proof”. Please see our Personalization Guidelines page for more info. 3-Panel Maps - What's the Big Deal? What makes our large 3-panel travel maps so darn special and awesome? Well, for starters, the clean lines and frameless design give the map a striking contemporary look that guarantees your map will instantly become the focal point of any room it is hung. Additionally, these babies are more than double the size of our single-panel gallery wrapped maps, giving you larger text and more pinnable space to map your travels. The larger size of this interactive art piece also ensures your map is a more prominent design element that compliments your home, office or business décor. Last, but not least, our 3-panel Canvas Maps are printed on premium canvas to create a vibrant print with a rich, textured look and feel. See how quickly your 3-Panel Push Pin Travel Map becomes the ultimate conversation piece that inspires wanderlust in you and your family for a lifetime. All of our Push Pin Travel Maps are handcrafted in the USA. We take great pride in every single map we produce. Each 3-panel pin map is personalized and printed in house using our high-end latex printer, which creates a vivid print that truly looks like a work of art! After the map is printed, the process starts by building 3 wooden frames. Next, we attach each frame to a sheet of hardboard for additional durability. We then affix sturdy foamcore board to each frame and then masterfully stretch the canvas panels over each frame with our slick stretching machine, while securing the canvas on the back to ensure nice, clean lines. A metal hanger is installed on the back of each panel so your map will arrive ready to hang right out of the box. Find out more details as well as answers to other popular questions in our FAQ section here. 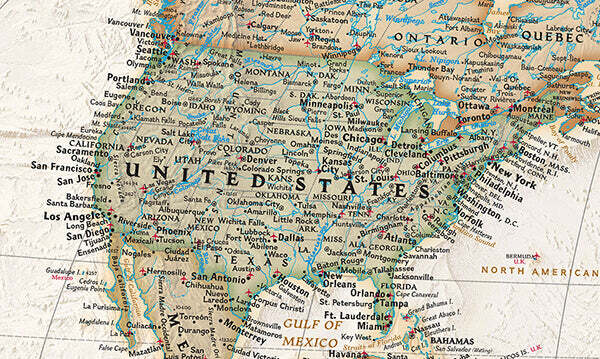 Since we ship so many of our maps as gifts, we do not include any invoices within the package. Feel free to leave a note in the Notes box (located in the shopping cart) if you’d like us to include a gift note when your map is shipped. Your 3-Panel Canvas Map arrives ready to hang right out of the box. Each panel will have a hanger already installed on the back. After you have found the perfect location to proudly display your map, use the included bear claw hangers for easy hanging. You, our amazing customers, asked for it and we delivered! We have partnered with National Geographic to officially license their stunning Executive World map to be printed on premium canvas. We also designed the 6 unique personalization options you see here so you can truly make your Push Pin Travel Map your own!